WELL-Designed Spaces Optimize Occupant Health And WELL-Being Architects have long considered people’s wellness in their designs by incorporating such elements as living walls, intentional staircases and relaxation rooms. In the past few years, the movement has gained strength as companies began using wellness programs to attract talent, reduce absenteeism and even lower healthcare costs. This led to the development of the WELL Building Standard in 2014 to certify building designs which ensure occupants’ comfort and health. 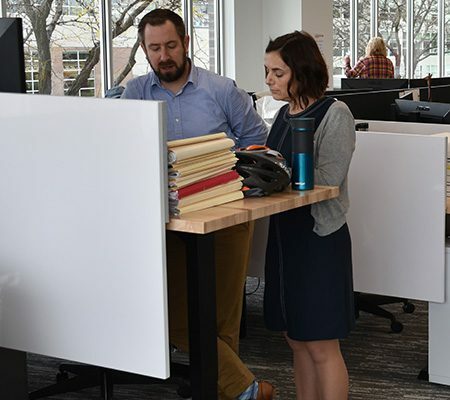 Strang, which often includes natural daylighting, living walls, standing desks and office treadmills in its designs, is officially part of the WELL-Built movement. Two staff members are WELL-accredited, and Strang’s new office in downtown Madison is on track to be one of the first offices in Wisconsin to obtain the WELL Building Standard Certification. “We believe in it enough to create a space for ourselves that meets these standards,” said Strang President & CEO Larry Barton, a WELL-accredited architect. Strang’s office highlights some of the WELL initiatives. In the kitchen, fresh fruits and sets out snacks containing no more than 30 grams of sugar are available. 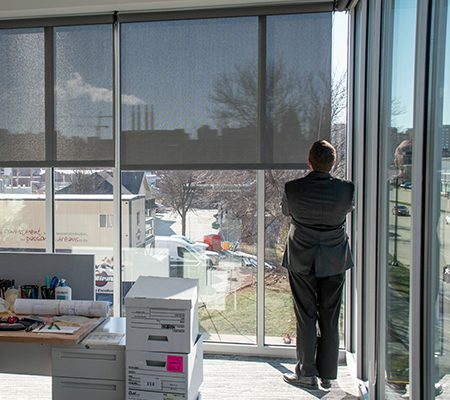 The lighting control system is capable of boosting light during morning hours and tapering off later in the day, aligning with our natural circadian rhythms. Adjustable desks allow staff members to sit or stand throughout the day at their workstations. The air ventilation system brings in 30 percent more fresh air than mandated by code. Tthe air vent distributes air from a low side wall, so contaminants are brought upwards out of the breathing zone as the air is heated. And cleaning products are both non-toxic and hypoallergenic, so toxins are not introduced. The WELL Standard, created by the International WELL Building Institute (IWBI), is third-party certified by the Green Business Certification, Inc., which also administers the LEED (Leadership in Energy and Environmental Design) program. The standards set a measurement how much building designs improve the occupants’ nutrition, fitness, mood, sleep patterns and performance. In a 235-page document, the IWBI spells out what it takes for a building to become WELL-certified and outlines seven categories: air, water, nourishment, light, fitness, comfort and mind. Floor-to-ceiling windows allow light in while shades help to moderate the amount of sunlight at Strang. Desks at Strang can be adjusted as standing workstations. Each category has subsets for quantifying the standard. For instance, air standards are met by ventilation effectiveness, microbe and mold control, pesticide management and more. Within each category, points are accumulated by meeting preconditions. A final scorecard is the aggregate of all the WELL scores for each. Certification is awarded on three levels: Silver, Gold and Platinum. The program certifies projects meeting standards and recognizes professionals who pass rigorous testing. It’s not only architects who can earn the credential. 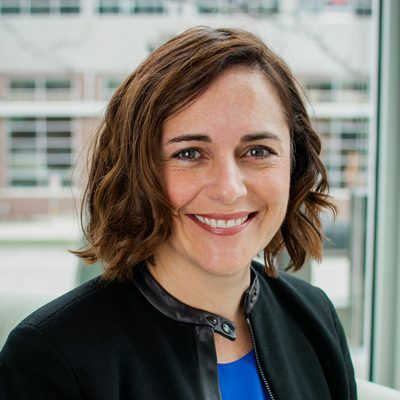 Engineer Katie Lowery, Strang’s Director of Integrated Control Systems, is also WELL-accredited. It’s important we go through the process of becoming accredited professionals,” she said. “While wellness is a part of the culture at Strang and is often incorporated into our designs, we’re learning from our clients that wellness is an increasingly important workplace issue for them as well. A green wall at American Family’s work-café brings nature inside. The IWBI reports the physical workforce is one of the top three factors affecting performance and job satisfaction. It also states that by investing in people, a company could see a meaningful long-term return on investment. Wellness also has an impact on staff recruitment and retention. When a company requests WELL standards for its built environment, it signals to employees, clients and the community that health is a priority. But even without certification, building with people’s health and well-being in mind is something that should always be considered. There’s a sense of satisfaction in creating spaces that foster healthier working environments.